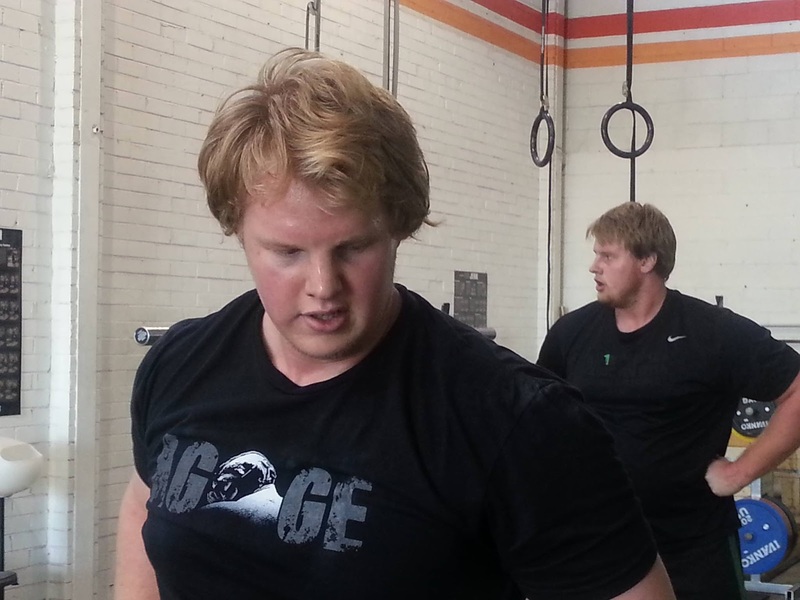 The diary blog page of Blake and Sean Muir, brothers, former Sutherland Seahawk players and now Baylor Football offensive linemen. Players report August 5th, first practice is August 6th. There will be a 'Meet The Bears' day for fans at the end of the first week of practice which has been a tradition that will continue. The first few days of practice is also when official photos are taken. Get excited!! We're only a week away!! 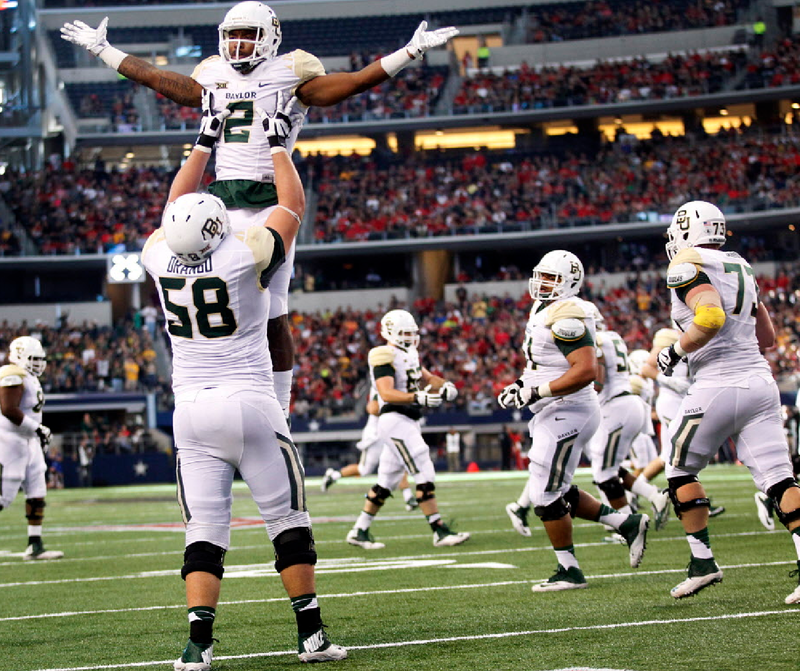 you can catch up on the Big 12 Media Day for Baylor here. Media Day is one of those off season rites of passage for a program that really starts to let everyone know that the new season is coming soon. There will be a week off next week in the lead up to Fall Camp beginning Aug 5th. That means only 1 month after that till the SMU game. Its coming around very fast. 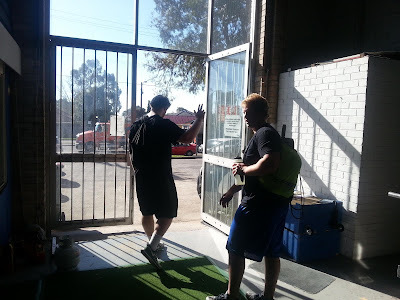 The 2nd Annual Lift for Life was today. Looks like by the latest figures from this site they've raised just over $8000 for Cerebral Palsy research funds. The Offensive Line led the way!!!! Thank you to those who joined this diary page in donating. 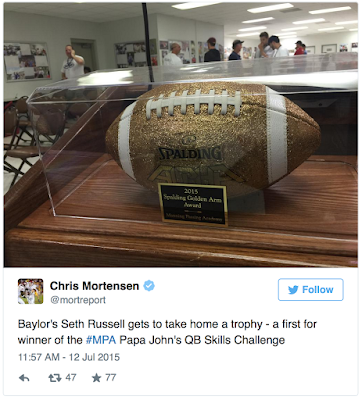 The off season accolades continue for Baylor. 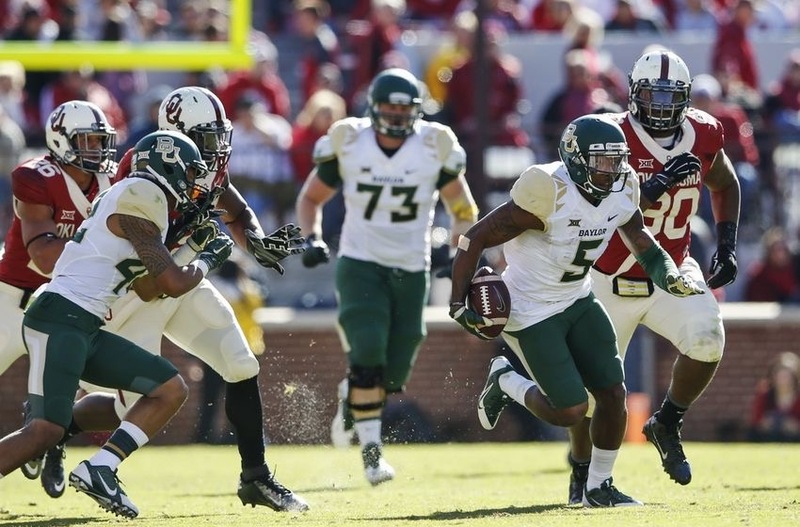 The Big 12 Conference released its All Big 12 team and 7 Baylor players made it; the most of any team in the conference. This was voted on by media pundits. 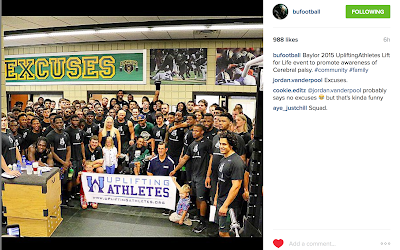 Read the report here from the Baylor Athletics page. 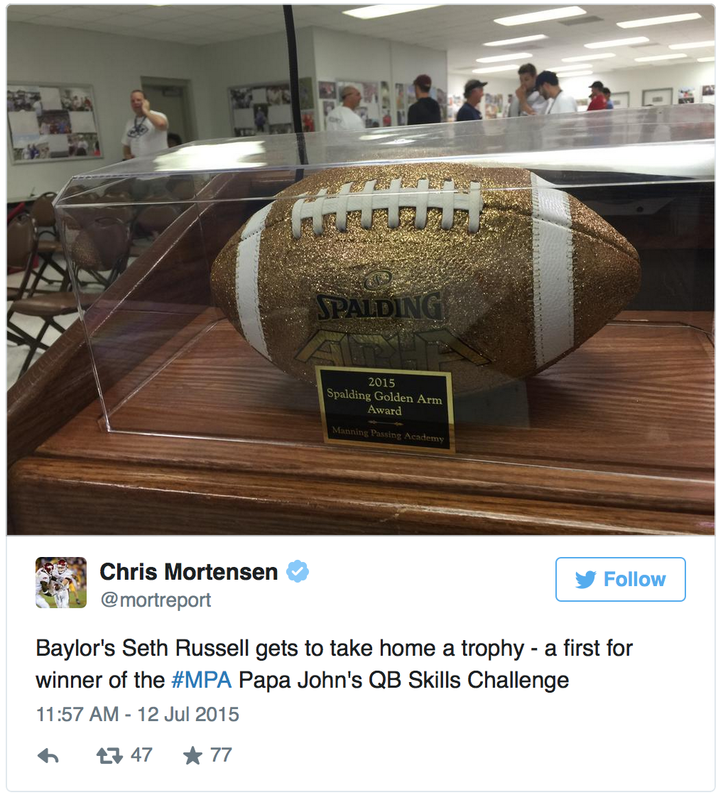 Baylor QB Seth Russell has beaten out some very good college QB's and won the Manning Academy Passing Challenge. Last year Sean Mannion beat Bryce Petty, Marcus Mariota, Jameis Winston and Brett Hundley. July is the last month without football. Fall camp is just over 3 weeks away and so the preseason magazines and reviews are coming it thick and fast. Here's one from SB Nation. The Outland Trophy has 3 representatives from Baylor. Spencer Drango, Andrew Billings and Beau Blackshear. Read about it here on the Baylor Athletics page. The Lift for Life fundraising event is on again this year. The targeted goal for this year is $10,000 and anyone interested can follow this link to donate. 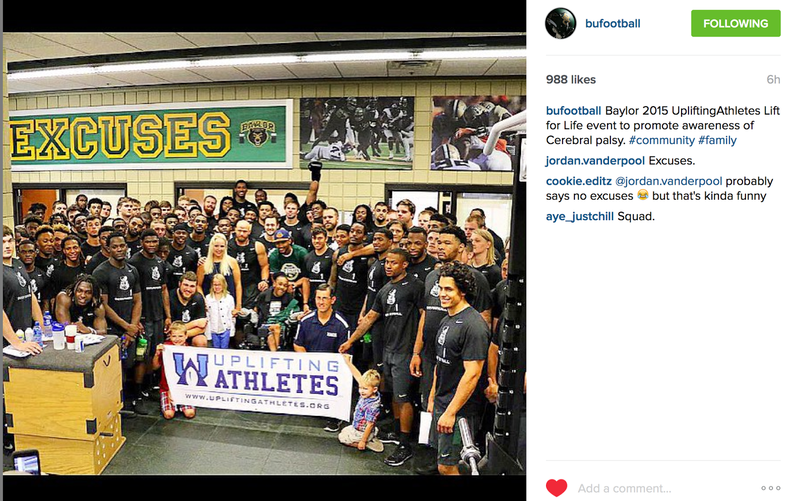 Raising money for the research into Cerebral Palsy has been the focus of this event which is coupled with a lifting challenge day in the Baylor Weight Room. Blake made the Big 12 Commissioner's Honor Roll again for the Spring semester. The boys will arrive in Dallas for the 4th of July National Holiday in the US. Well the boys are off now and have wrapped up their training at home. We got some good work done. Blake weighed in today at 322lb which is his heaviest and Sean weighed in at 296lb, also his heaviest. They both got stronger, bigger and kept their conditioning up so they'll be in as good shape as could be hoped for when Fall camp starts in a month. They will start school again next week and be training with the team leading up to Fall camp. Its Summer in Waco, this is the hottest part of the year so many days will be up in the high 30's and into the 40's. Some more training clips will get posted later. This is the last week before the boys head back to Waco. At this stage they are leaving home on Saturday, will arrive in Waco on Saturday night local time, 2nd Summer Session for school begins on Wednesday and there will be training during the week. We're putting together some clips of some of the better lifts that the boys had while they were training in this block at home. Here is Sean with a PR on the limit for a backsquat double. On Friday we'll put up some more extensive footage of what has been a success period of training. I'm always finding pics I haven't seen before. Seems like the Dallas Morning News has a poor gauge on how things have worked on the Baylor football team roster judging by their Summer filler piece. In breaking down Baylor's top 25 players here is the comment on Blake at #19. C'mon people, how about some accuracy in reporting! Right Guard is the position Blake has spent the LEAST amount of time practicing at. Left Guard, Left Tackle, Right Tackle and a little bit of Center are the positions Blake has practiced at. Left Guard being the position he started at all through the 2014 season and Fall camp; and Spring camp 2015. If you're going to write something, get it right. 5 minutes of research would have explained this.